Jojo Struys - MC of the day. 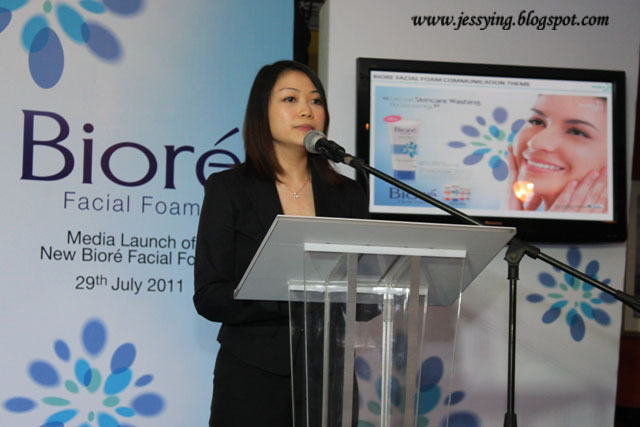 On 29 July 2011, I attended Kao Biore media launch their latest skincare facial foam with Skin Purifying Technolog which will replaced their existing range in the market. So read more to find what so special about this range. Mr Murakami, Yoshihiro shared that their latest skincare facial foam has the latest Skin Purifying Technology (SPT) which came after the result of 31 years’ worth of research and tests catered to improve the way women all over the world take care of their skin. With this new technology, your skin is gently yet thoroughly cleanses dirt and sebum without removing your skin’s essential moisture, leaving your skin feeling light and evenly smooth skin. And it is called the skincare washing foam for that reason. This skincare washing foam which is not your normal cleanser. The normal cleanser gets rid the skin of dirt and sebum but will also have the cleansing agents which tend to penetrate deep into our skin causing more harm as our skin’s natural moisture and pH levels are compromised. 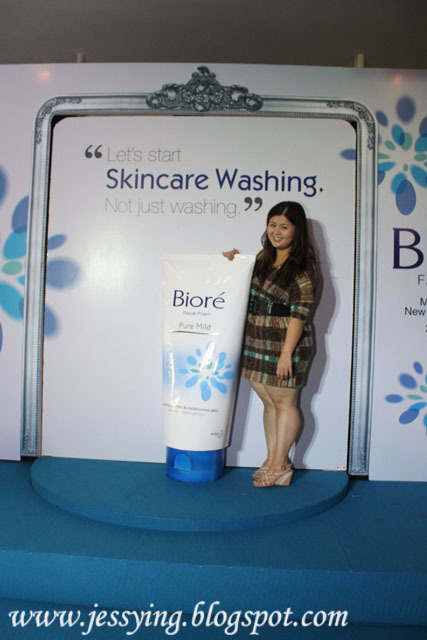 However with Skin Purifying Technology in latest Kao Biore facial foam, all these challenges are no longer an obstacle. SPT does not irritate the skin but focuses only on removing dirt and sebum on the skin, even in the pores. The cleansing agent in SPT is not absorbed deep into the skin, but working only on the skin surface. Therefore the skin’s natural moisture and pH levels are maintained even after it has been cleansed with the Kao Biore SPT cleanser. And with daily usage, the skin’s natural form is restored and the skin is able to renew itself effectively thus unveiling our skin true beauty. 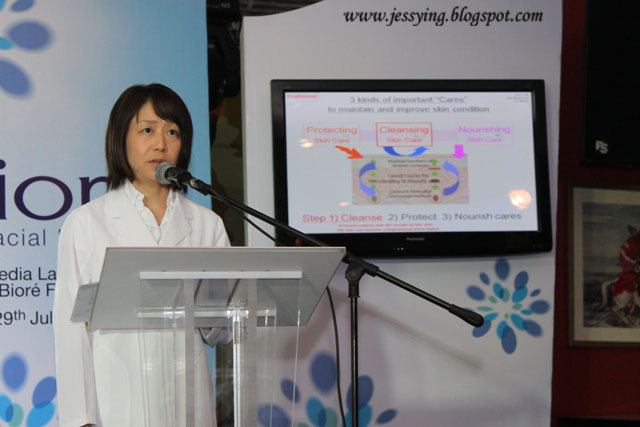 Ms Matsuo, Keiko - Manager of Global R&D Skin Beauty, Kao Corporation Japan explained that the human skin is designed in such a way that it renews itself every 4 weeks. However, when dirt and sebum clog up our skin it is making our skin difficult to renew itself effectively. As a result, skin will begin to look dull and lifeless while makes our skin to be more prone to skin problems like acne and dry skin. By then the skin repair process will slow down and will caused it loses its softness and elasticity making room for all kinds of skin problems. So while it is important to use a cleanser that could removing dirt and unclog our clogged pores effectively it must not affect our skin natural renewing process. 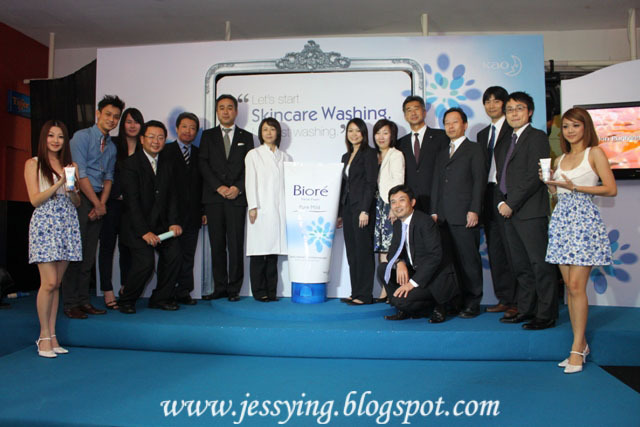 Ms Matsuo did an experiment at the event to show to the media friends that the latest Kao Biore with SPT does not change the moisture and texture of the skin while doing the cleansing job. 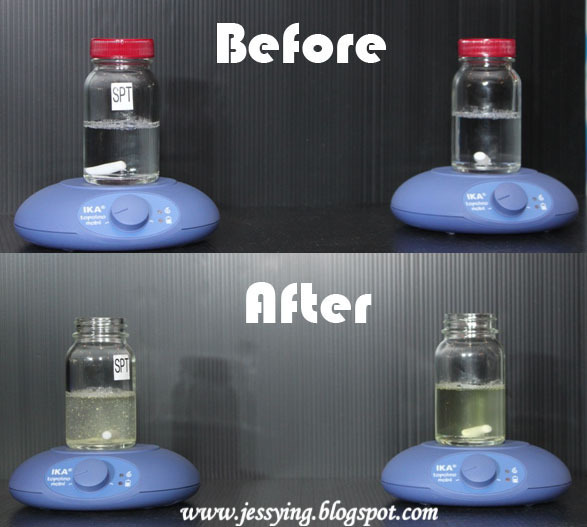 After the protein was put in both the bottle( left side having the normal cleanser and the right side filled with SPT cleanser), it was stirred. After approximately for 5 minutes the protein in the bottle of water with Skin Purifying Technology cleanser does not disolved or changed the texture of the protein while the other bottle of water with normal cleanser has dissolved the protein. This showed that Kao Biore latest SPT cleansing agent is not absorbed deep into the skin, working only on the surface hence left our skin moisture and texture untouched. 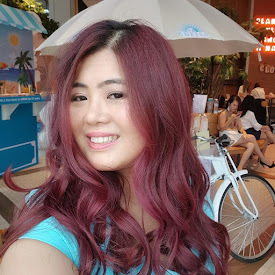 Ms Joyce Chu, Skin Care Brand Manager of Kao (M) Sdn Bhd introduced the four different skincare washing which caters for people with different skin concern. Thoroughly removes oil & impurities at T-zone area while leaving essential skin moisture around the delicate U-zone. - Formulated with Natural Rice extract to soften & lighten skin, revealing pure & even more supple skin. Contains Crushable Beads that unclogs and deeply cleanses pores to remove accumulated impurities and excess oil. Formulated with Witch Hazel that helps tighten pores, making them less visible to reveal smoother, brighter & oil-free skin. 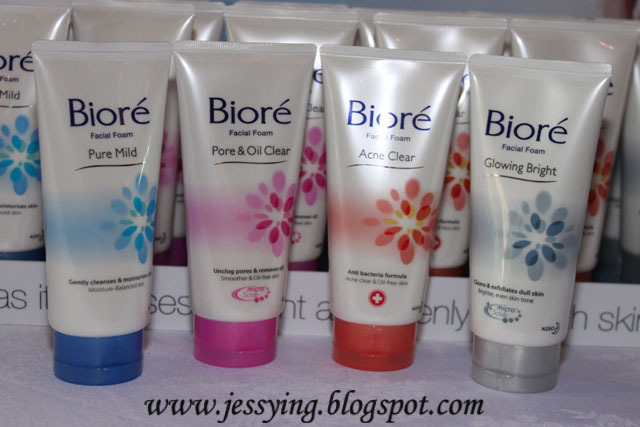 Contains Triclosan, an anti-bacterial agent that effectively fights bacteria that causes acne. Leaves skin acne & oil free. Contains White and Green Double Brightening Micro-Crushable beads with Green Tea extract that helps exfoliate dead skin cells while removing impurities and excess oil. Formulated with Vitamin C to help lighten skin for visibly brighten and even skin tone with healthier glow. The four pretty models with the four different cleanser. A group photo of the Kao Biore team. Me and the super huge cleanser - Can I bring this home? 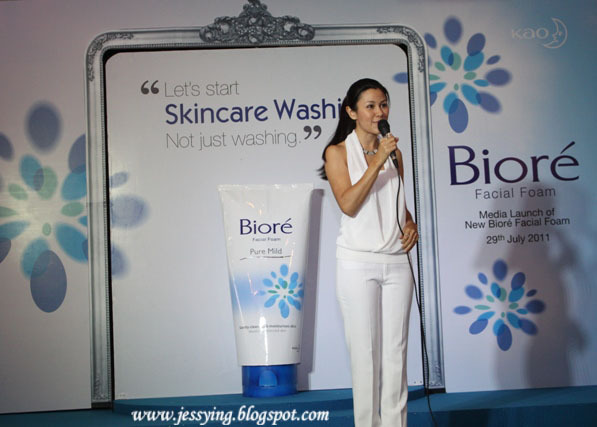 Well after I heard about the explanation about this latest Kao Biore skincare washing with Skin Purifying Technology I am convinced to try this range because personally I do believe as well that a good cleanser (whether its counter or pharmacy brand) should not make our skin dry and tight after washing but should merely does the work of cleaning away the dirt on the surface & pores of our face. 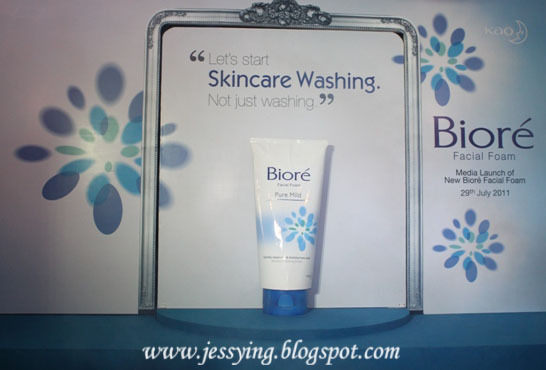 And if you have tried this latest Kao Biore skincare cleanser, share with me our experience here! I will give this range a try of this skincare washing range and put up a review soon ! p/s: Buy a copy of the latest August Cleo Magazine as it comes with a sample (15g) for you guys to try!